Magnificent! Thank you for finding and posting this, Cliff! It's undated unfortunately, and it documents the "Battery Engine" rather than mentioning the turret, but the style of the text and look of the drawing make me wonder if it might date to the civil war period. There may or may not be any useful info in these, but I thought I'd mention them in case . I just joined your Forum, but thought I would poke in on this . It was the same-yet different. The hull design was changed( rounded) and was bigger and most notably, the Captain and Helm were moved to the top of the turret . The engine was close to the Monitor's design, except for the Exhaust/Condenser piping ( 2 instead of 1 )which required a different porting on the engine. The Monitor had an Asymmetrical Engine and the Passaic had a Symmetrical Engine design. The Passaic first met up with the Monitor in Washington Navel yard on Christmas day 1862 and of course, the Monitor was lost a week later on Dec 31 when it went on a mission. I suspect the turret drive was the same. I can't get the link to display your Passaic Battery Drawing, but suspect it is the one in the National Archives file with a 3-3-32 number on it. It has been fabulous to follow the comments and drawings here...thanks fellows ! Hello Rich, welcome to the forum. That's interesting about the dual condensers, I had not known that. Here are some Passaic type links pulled together from past posts and other collections. In the Scientific American for December 12, 1863, on page 372, there is a long article entitled "The Monitors". This volume of the Scientific American (V9) can be downloaded as a pdf from Google Books. The article is dense with specifications and dimensions for the original USS Monitor and for the nine Passaic class monitors that followed it. I was surprised to learn that the Czar built ten Passaic class monitors for the Russian navy, beginning in 1865, following the American plans. Presumeably this was under a licensing agreement from Ericsson. Re the turret drive, I agree the V-twin engine was essentially the same as that of the original monitor. The drive configuration was quite different because, as you point out, the turrret axis was like a tree supporting the pilothouse, and the turret had to rotate around this fixed tree. The reversing engine drives a crown gear that rotates in the plane of the lower deck, and is a little hard to see in this photo. It is geared to the vertical shaft at right, which ascends through the ceiling to drive the turret via a large diameter gear mounted below turret floor. Thank you Michael for the info ! I haven't dropped Devin a note yet. Life has been extremely complicated since my post last month and delayed my response, but this is not the place for that. Sorry if I mislead you on the condenser, there was only one, but the exhaust manifold had TWO pipes, which meant they had to have a "Y " pipe feeding the condenser. I need to visit the National Archives in Washington DC to follow up on the drawings if available. I am working with the Mariners Museum on publishing a book about the Monitor's Engine. Taking a Solidworks Class to help me in that venture ! I am Swedish and had a relative check it out for me as I do not read/write Swedish and the Swedish Marine museum did not understand my requests. My cousin told me they gutted the original engine and used the ship as a barge before it was placed in the museum. They also have no drawings or details of the original installation, even though John Ericsson is a real hero over there. Rather later vintage than the original Monitor of course, but perhaps some of the details will still be informative. These are really interesting. The date I noticed was 1896. Do you have (or does there exist) an arrangement with the archives that alerts you by email when a keyword like “monitor” is associated with a fresh scan or update? No arrangement - I usually just periodically search the NARA ARC using their advanced search (https://catalog.archives.gov/advancedsearch) for engineering drawings in RG 19 with no keywords, and (so far at least) the default ordering of the search results if you don't give it a keyword seems to be the most recently added/updated entries in the catalog. My understanding is the NARA staff are gradually working their way through scanning the ship drawings (so far, the ones stored flat since they're easier to deal with.) I've noticed a roughly alphabetical progression of new drawings over the months, but it looks like this grouping is the first one they hit that was from a monitor ship. Any new work on the Monitor CAD model, or has it pretty much reached its finished state? Thanks for the information about the archives, Cliff. 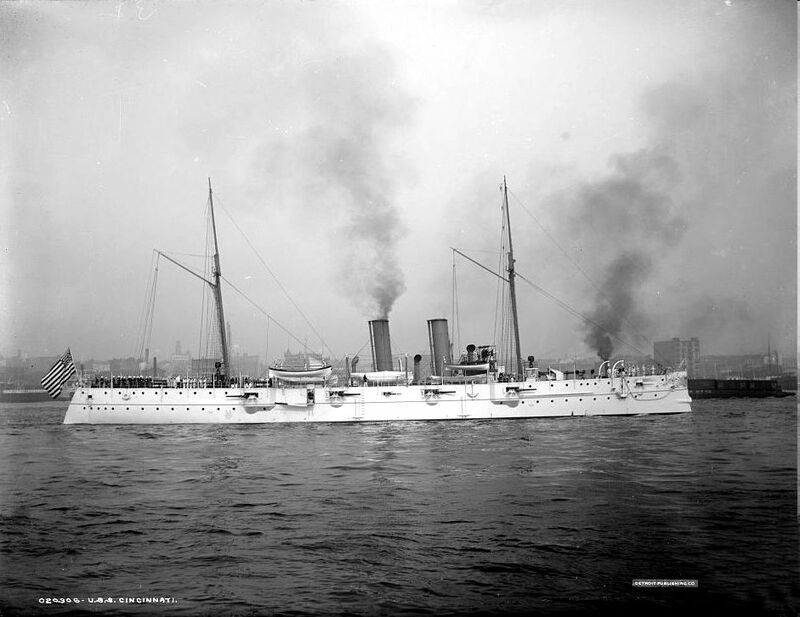 I have been intrigued by a cruiser from the late 19th century, the USS Cincinnati. Since they are by now well past “C”, maybe there are fresh scans. Re this USS Monitor project, and to coin a phrase, it ain’t over ‘til the fat lady sings....! Looks like only 2 drawings from that group are online, neither of which pertain directly to the ship itself. That may mean that there either aren't many in that group, or just that the majority of the drawings weren't "low hanging fruit" for scanning purposes. The other likely source for potentially useful drawings would be the other ship from that class, the USS Raleigh (https://catalog.archives.gov/id/53484828) but it doesn't look like any of those are online yet. One thing that might be worth trying (and also asking about the possibility of email notifications of new search results) would be to inquire at the NARA's History Hub website: https://historyhub.history.gov - the NARA archivists are active in the forum, and I've gotten a number of very helpful responses. Thank you Cliff. I signed up for the Archive Catalog emailings. The most likely collection of drawings to have the hull lines would be for the initial ship of the class. Any drawings for subsequent ships in the class would only include changes from the original design. For example, for the 27 ships of the Cleveland class and the subsequent missile conversions there are seven sets of drawings (about 12,000 individual drawings) in the Archives. However, only the drawings for the first ship, the USS Cleveland CL-55, have any drawings of the hull. The Table of Offsets (if it exists) is much better than the hull lines drawings. The table gives the numeric dimensions of the hull that were actually used in the ways to build the hull. Often the basic Table of Offsets is included on one of the hull line drawings, but sometimes it is found in the "mold loft offsets" in papers included with the drawings. If you are interested in the hull plating the Table of Sight Edges (in the mold loft offsets data) gives the numeric positions of the edges of the hull plating. This is far more accurate than trying to estimate the three dimensional curved edges of individual plates from flat two dimensional drawings. I don't know when these tables started to be used, so they might not exist for ships built in the 1800s.